1. I was a Scientologist and held many positions in many sectors of Scientology, hereinafter referred to as "the organization," from 1969 to 1981. I have been involved in organization litigation as a witness, defendant, plaintiff and paralegal from 1982 until the present. I have testified in three trials and in depositions in ten organization cases approximately forty-seven days. I have authored over twenty-five declarations concerning L. Ron Hubbard, Scientology practices and the litigation. I am by trade a philosopher, writer and artist. In 1986 I founded a church which now has many members internationally. 2. I am the defendant and cross-complainant in the case of Church of Scientology of California v. Armstrong Los Angeles Superior Court No. C420153. A decision in that case was rendered after a lengthy bench trial by Judge Paul Breckenridge, Jr. on June 20, 1984. The California Court of Appeal opinion, No. B025920, issued July 29, 1991, affirming the Superior Court's decision, has recently been filed in this case as an exhibit to the Aznarans' oppositions. 3. In December 1986 I entered into a settlement agreement with the organization, a copy of which is filed herewith as Exhibit . The organization did not honor the agreement, however, but has continued a program of threats and attacks to this day. I have detailed what I knew of these threats and attacks up to March 15, 1990 in my declaration of that date. The circumstances at the time of the settlement and a rebuttal of various organization attacks are contained in a declaration I executed on December 25, 1990. I can supply these declarations to the Court if it so wishes. 4. I make this declaration to respond to various allegations about me made by the organization in its papers recently filed in this case. 5. Organization attorney Laurie Bartilson states that my aid to attorney Ford Greene in preparing the Aznarans' recently filed oppositions to organization motions "violated this Court's orders and the Local Rules." (Defendants' Opposition To Ex Parte Application To File Plaintiffs' Genuine Statement of Issues [sic] Re Defendants' Motions ( 1 ) To Exclude Expert Testimony; and (2) For Separate Trial On Issues of Releases and Waivers; Request that Oppositions Be Stricken; hereinafter "Opp To Ex P", p.2,3.) I aid Mr. Greene and the Aznarans out of my own free will and my sense of right and wrong. If I am ordered by any lawfully constituted court to cease rendering such aid I will. 6. Ms. Bartilson states that I "[am] employed by Joseph Yanny on this very case. "(Opp To Ex P p.4) I am not. 7. Ms. Bartilson states that for me "to now have switched [my] aid to Greene's office further taints all (emphasis in original) of the papers filed by Greene..."(Opp To Ex P p.5) It doesn't, because there was not and is not any taint. 8. Ms. Bartilson states that my aiding Mr. Greene "is grounds for [his] disqualification. "(Opp to Ex P p.5) It isn't; but if this Court were so to order me, I will comply. 9. Ms. Bartilson suggests that Mr. Greene should be disqualified because I am "a paralegal formerly employed by defendant's lawyers." (Opp To Ex P p.5) I have never been employed by any organization lawyer. often for hours and days at a time." (Opp To Ex P p.9, para 4) I was outside the United States from August 3 until August 10, and not in Marin County where Mr. Greene's office is located until August 13, 1991. Filed herewith as Exhibit  are copies of my boarding passes for my flights from San Francisco to Johannesburg, South Africa on July 19 and 2 0, returning August 9 and 10. 11. Organization attorney William Drescher states that "[a]s [I am] Yanny's paralegal on this case, [my] near affiliation as an assistant to Ford Greene is truly outrageous." (Supplemental Memorandum In Support of Defendants' Motion To Dismiss Complaint With Prejudice; hereinafter "Supp Memo," p.4) I am not Mr. Yanny's paralegal on this case, and my affiliation with Mr. Greene is wholly peaceful, lawful, decent, helpful, respectful, and humorous. 12. Mr. Drescher states that "Yanny's involvement in this case continues, this time through a different "extension"--the improper activities of Yanny's paralegal, Gerald Armstrong." (Supp Memo p.5) I am not Mr. Yanny's paralegal. I answered his call for help during the period he was attorney of record in this case. I spent parts of two days on July 15 and 16 in Mr. Yanny's office during which time the only "work" I did was to write two declarations, one of which was also used by Mr. Greene. Mr. Yanny gave me no instructions or suggestions at any time to pass on to Mr. Greene or to anyone else involved in the Aznaran litigation. I am not Mr. Yanny's "extension" into this case. This organization's actions in attempting to deny their victims, the Aznarans, not only legal representation but support to the Aznarans' legal representatives is what is improper. organization is not a church. Organization operatives David Kluge and Michael Rinder sought me out and gained my trust through a close friend whom the organization coerced into participating in an operation to attempt to entrap me. The organization operatives stated that they wanted to reform the organization and rid it of its criminal activities and they asked me to help. They said they wanted to save Scientology from its criminal leadership. They stated they were operating secretly within the organization for fear of, inter alia, being killed. They used my willingness to communicate and to help to attempt to enveigle me into the commission of a crime. When that failed, the organization simply twisted my refusal to participate in the suggested criminal act into further accusations. 14. Mr. Drescher states that "[t]he Church obtained information about [my] plans and, through a police-sanctioned investigation, provided (me] with the "defectors" [I] sought." (Supp Memo p.5) That the organization and its lawyers have told this lie so many times in so many jurisdictions over so many years has not made it any more true now than when they concocted the plot. I was videotaped. The videos are still embarrassing to me because I use foul language. What I say does not mean what the organization and its lawyers say it means. A private investigator (who, during this period threatened to put a bullet between my eyes) obtained a false authorization from an LAPD officer, who was himself suspended six months for his participation in the crime. The organization did not obtain information about my plans; it created the whole operation, including what my " plans" were to be. Memo p.5) I never considered Rinder my agent, nor did I consider that I had any agents. Rinder was not loyal to the "church." He was being operated by what the operatives called the "criminal leadership." 16. Mr. Drescher states that "the conversation [was] recorded with written permission from law enforcement." (Supp memo p.5) It wasn't. The Chief of the LAPD denied authorizing the illegal operation, and the officer was suspended for his 'permission." 17. Mr. Drescher quotes some out-of-context statements from my November 1984 meeting with Michael Rinder and avers that they meant that I was recommending that the group of "reformers" did not need "actual evidence of wrongdoing to make allegations in Court against the Church leadership." (Supp Memo p.5) My answer to Rinder is out of frustration because he appeared to be unable to understand that a complaint contains allegations, and the proof of the allegations is achieved through documentation and testimony, including even the well-known fact of the organization's long history of destruction of evidence, obtained through the litigation up to the end of trial. Elsewhere and in other conversations I discussed with the "reformers" what was actually known and documented, and which could be alleged in the complaint they insisted they wanted to file. I discussed with the 'reformers" an inventory of criminal acts for which we knew the organization was responsible. They included burglary of state and federal offices, theft, obstruction of justice, blackmail, assault, civil rights violations, immigration fraud, tax fraud, attempted entrapment of Federal judges, framing of my own attorney Michael Flynn, the use of preclear folder information against all Scientologists, all the acts which flowed from " " fair" game," and the use of their charitable corporation funds to carry out these criminal acts. 18. 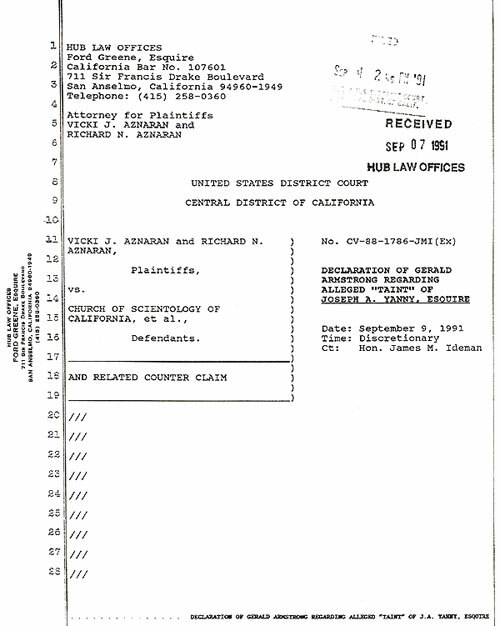 Organization attorney Eric Lieberman states that "the utter disregard of the truth that the Aznarans have made the trademark of their litigation effort, bears the unmistakable signature of Gerald Armstrong, whose theory of litigating against Churches of Scientology, as captured on videotape in 1984, is not to worry about what the facts really are, but instead to choose a state of "facts" that should survive a challenge by the Church and "just allege it."" (Reply In Support of Defendants' Motion For Summary judgment Based On the Statute of Limitations; hereinafter "Reply Stat Lim," p.2,3) This is not true. It is simply further exploitation of the fruits of the organization's covert actions against me: the illegal 1984 videotape regarding what the organization calls the "Armstrong Operation." Until I started to help Mr. Greene, I had nothing to do with the Aznaran case, which was filed in April 1988, except for my help to Mr. Yanny described in paragraph 12 above. I have given no facts to the Aznarans, nor any legal strategy. Besides the declarations I have written, all of which are now before this Court, I have written not one word in any of the filed papers. My help to Ford Greene in all of the papers recently filed has been in proofreading, copying, collating, hole-punching, stapling, stamping, packaging, labeling, air freighting and mailing. Mr. Greene and I have had several conversations during this period, some of which certainly concerned the litigation. perverts the law, manipulates courts, testifies falsely, fights unfairly, wields religion as a sword and then a shield and abuses the legal process, justice will, if fought for honorably, triumph. 20. Mr. Lieberman states that [o]n August 19, 1991 [I] admitted to one of defendants' counsel that [I ] was at Greene's office "helping out."" (Reply Stat Lim p.3) I admitted no such thing. I was doing nothing even faintly improper which would require admission. I have been completely up front about my being in Mr. Greene's office and helping him. It is the organization which has skulked around and engaged in improprieties which it should admit to. I was so shocked when I discovered the organization operatives videotaping me on August 2 0 that I wrote Mr. Lieberman to protest the harassment. When I found the operation continuing on August 21 I again wrote Mr. Lieberman, and called his office, advised one of his associates of the operation and pleaded that it be called off. Copies of my letters are filed herewith as Exhibits and . Mr. Lieberman has not answered my letters, has not mentioned them in his papers, which he signed on August 26, but has escalated the attack on my character and intentions. The operation has continued at least until August 30. Because of its form and nature, and because of my knowledge of organization operations and its philosophy of opportunistic hatred, I believe that this operation does not have as its major goal the proof that I am helping Mr. Greene. I believe its goal is intimidation and the assembly of intelligence information for future acts. established the Guardian's Office and then the Office of Special Affairs to carry out his way of litigating. organization, not denies its existence, but completely and sincerely repudiates it. 23. Mr. Lieberman states that "[my] philosophy of litigation is that facts and the truth are irrelevant and that all that is required to prevail is to allege whatever needs to be alleged." (Reply Stat Lim p.34) I have survived all the cross-examination and depositions by the organization, the documentation attacks by the organization, the character assassination by the organization, the use of my preclear folder information, the operations, the threats, the assaults, because truth is relevant. Although there undoubtedly is some memory loss over the past twenty-two years, and although there may even be some discrepancies in forty-seven days of sworn testimony, I have survived examination and cross-examination because I have, as much as is humanly possible, told the truth. I have said what I have known, known when I didn't know something, and stated my opinions as opinions. It is my opinion that one honest man can confront and vanquish a dishonest organization, no matter how big or how organized. Gratefully there are a few honest men to make the work lighter. no time to do them. He has no employees but a secretary who comes in a couple of evenings a week sometimes and sometimes on Saturdays. He needed simple office backup in the form of proofreading, photocopying, collating, hole-punching, etc. I am blessed with those simple office skills, and I have a knowledge of the subject matter and the cause in which Mr. Greene labors. I am aware of the awesome disparity of resources between Mr. Greene and the army of law firms, lawyers, paralegals, secretaries, and organizational legal machinery of his opposition. I am aware of the organization's policies and practices of neutralizing or eliminating the legal support of its enemies. How could anyone resist a call to help in this situation? It was not a conspiratorial thought that plunked me down over a year ago within running distance of the Hub Law Offices and sporting the same zip code. What it was was merely making the inevitable not only funny but easier. 25. Organization attorneys have made much of the fact that Joseph Yanny has been enjoined from representing me in litigation. adverse to the organization. (Op To Ex P p.10; Supp Memo p.4) He is, of course, its former attorney. I have been working with Mr. Greene since August 17. I have not seen nor heard one word of Mr. Yanny's influence in this case, beyond the fact that the organization just alleged it. I declare under penalty of perjury under the laws of the State of California and the United States that the foregoing is true and correct. Executed on September 3, 1991 at Sleepy Hollow, California.